I see where the mistake came from. Unfortunately, there just aren’t that many Jews of color in our community. But still: don’t assume that that the black boy on the Jewish day school bus is the bus driver’s kid. Yeah. That happened. I don’t think I need to tell you how it made the kid’s mom feel. I don’t think I need to tell you what that says about our school community’s assumptions, commitment to inclusivity, and default gatekeeping. But to be crystal clear: it was devastating. There’s some context, to be fair. Our bus had been a mess the first couple of weeks of the school year. The driver was late (hours late), partly, it emerged, because of childcare challenges. (Insert full rant about the need for much better and more comprehensive and more affordable childcare in the US.) So yes— there was a day when the driver’s kids, an older girl and an infant boy, were on the bus. Once. Neither of them was five years old. Neither had been riding the bus every day since the beginning of the year. Recently, a fellow Jew of Color (JOC) posted on social media that she was feeling apprehensive about attending upcoming Dr. Martin Luther King Jr. Day celebrations in her Jewish community. Several other JOCs and parents of multiracial Jewish children shared her reaction, saying that MLK Day Shabbats often read as haphazardly organized, superficial efforts to celebrate diversity. On a different space on social media in response to the Jewish Women of Color Women’s March Sign-On Letter, I witnessed a white Jew lamenting that Jews don’t get enough credit for the work they did during the Civil Rights movement. This reflects the same problem. All too often, the Jewish community focuses on the work of the late 1960s while not recognizing the need for or engaging with antiracist work in the present day. Thankfully, another white Jew in the social media group helped the commenter understand the ways that her original comment falls short. I have been watched or followed at a department store or boutique. When pulled over or in the presence of police I have feared for my life. When entering my shul security has searched my bag and my person. I have been asked how I am Jewish. I have been mistaken for a service worker or the help. I’m usually the only person of my race when I am in synagogue. When requesting an aliyah, I’m asked how I converted. If these questions are foreign to you, you benefit from white privilege. If you have asked some of these questions yourself (like “how are you Jewish?”), you have perpetuated white supremacy. Our nation’s institutions and systems are based on the idea that whiteness is the norm, the ideal, and anything other than whiteness is considered wrong, lesser than, other. And Jewish institutions are no exception. Like every Jewish person across the world I was heartbroken, angry, and frankly scared after the Tree of Life shooting last year. And like a lot of Jews of Color I know, I cringe and worry for the lives of my fellow JOCs trying to enter police-guarded places of worship. This tug is at the center of what it is to be a Jewish person of color living in America today. When you question the validity of someone’s Judaism (by asking if they understand the order of service, or if they converted, or asking their “story”), you are perpetuating white supremacy. When you have the urge to talk about Nazis and white supremacists as oppressors, but do not acknowledge other systems of oppression, of you are perpetuating white supremacy. When you dismiss the words and concerns and perspectives of People of Color (POCs) and Jews of Color, you are perpetuating white supremacy. When you say, “But not me!” or “I have a lot of friends who are POCs!” you are perpetuating white supremacy. When you herald Rabbi Heschel and Dr. King for one Shabbat each year, yet JOCs are not in positions of leadership, members of your organization’s board, or helping to make decisions in your organization; when you don’t do the work of making your Jewish spaces welcoming to JOCs and multiracial Jewish families; when you lean on JOCs to teach you instead of doing the work yourself; when you invite JOCs to share their stories and don’t pay them for the emotional labor of telling of those stories; when you exoticize Jewish communities of color in other countries without acknowledging the long-standing Jewish communities of color here, you are perpetuating white supremacy. When you feel safer with a police officer outside your place of worship without acknowledging how the presence of a police officer feels to a JOC, you are perpetuating white supremacy. I’ve written an article like this every year because the message needs to be heard every year. But the thing is, it doesn’t have to be this way. We, as a Jewish community do the legacy of Dr. King and Rabbi Heschel a disservice by looking to the past instead of addressing what is occuring in the present. We do a disservice to our communities by talking about tikkun olam instead of living it. Change does not need to be slow. It does not need to take time. It does not need to be a process. It’s actually quite easy. Here are some steps. Take a look at your organization. Who is in key leadership positions? Is there a Jew of Color? Or two? Or three? If not, ask yourself why not, and change that. Hire JOCs in positions of power. Actively recruit JOCs. Invest the time to work with Jewish leaders of color to recruit, retain and hire more Jews of Color. Next, take a look at your Board. Do you have JOCs represented there? Review your synagogue’s welcoming policies. Everyone should be treated equally when coming into shul. No one should feel singled out. This means that if you have a security guard, that security guard should be checking everyone’s bags and person, even if they come every single week. Remove words like “welcoming” “inclusive” and “diverse” from your synagogue’s welcoming page if your space isn’t truly welcoming, inclusive, and diverse. Don’t use stock photos or older photos of Jews of Color, especially if those folks are no longer in your community.. If these steps feel too hard to implement in your Jewish organization, you have to acknowledge that diversity and inclusion are not your priority and move on. If the idea of moving on and doing nothing doesn’t sit right with you either, then take the advice from our fathers and remember that “you are not obligated to complete the work, but neither are you free to desist from it.” King’s dream has not been realized. His work is not complete. The movement did not end in the 60’s. It continues today. We have an obligation to work towards justice and equality. That work begins with the individual. Listen and amplify the voices of Jews of Color, pay Jews of Color for their work, hire Jews of Color to work in your organizations and invite us to sit on your Boards. We are not the stranger the Torah reminds us to welcome. We are your brothers and sisters. From her book The Colors of Jews: Racial Politics and Radical Diasporism, 2007. Quoted by Maya Salam, The New York Times, August, 13, 2018. About three months ago I invited over 20 Jews into my home for a havurah we call the Tacoma Shabbat Experiment. 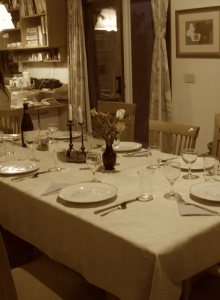 After my co-organizers and I finished leading Kabbalat Shabbat and the important bits of Ma’ariv, we sat down to a dinner that I’d prepared. I only planned for 20 people, and we had almost 30, but we found more plates, pulled up another table and folks sat on a hodgepodge of various lawn chairs and stools. Wine flowed, we tended to a pre-lit bonfire and folks meandered around the backyard my wife and I share with neighbors. I was saying goodbye to one woman when a man I didn’t know approached me and asked what my connection to Judaism was. Slightly tipsy and really pissed off, I quickly reminded him that his question was hugely problematic. He leaned in to ask about Ethiopian Jews and Ugandan Jews, hoping for some validation. Instead of realizing his misstep he continued to ask my connection to Judaism, claiming to not understand my objection to his line of questioning. Thankfully, a white Jewish woman stepped in and I turned my back to him to continue to say goodbye to a friend. This was not the first time a white Jew has questioned the authenticity of my Judaism based on the color of my skin. It was, however, the first time a white Jew had done this to me in my own home.